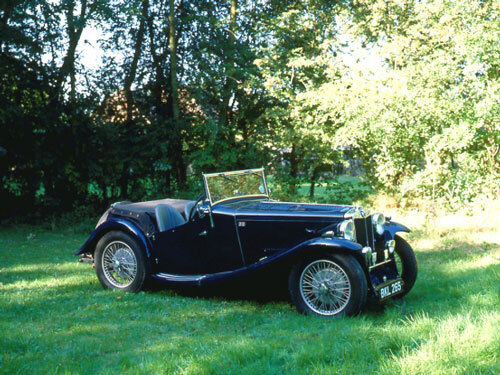 The MG Car Company was in a very commanding position in the early thirties, being the only company that were dedicated solely to the manufacture of sports cars. They had earned tremendous recognition and built a reputation second to none on their unfailing successes in racing and competition, particularly with small capacity engines. Cecil Kimber had always recognised the sales potential of associating the production cars very closely with the racing models and in 1932 a new series of cars designated K Type, was introduced into the model range which encompassed a variant built specifically for racing. Kimber knew he could not justify the manufacture of a racing model on its own and it is thought that he cleverly used the other K series cars as a smokescreen for the out and out racing model, the K3. It was at this time that the name Magnette was introduced to the series and it was this name that heralded the arrival of the "Light Sixes" as they became known. The impression generated by Abingdon was that the racing successes had boosted demand for their cars, but if the truth be known, sales were less than buoyant during 1933 and in fact price rises had taken their toll on sales. The new 6 cylinder Magnettes were considered very expensive and somehow did not generate quite the same affection for the marque as the Midgets of the era. The K series pillarless saloon version was considered noisy, cramped and underpowered and thus did not sell in great numbers. The 6 cylinder L series cars did fair slightly better and were on sale alongside the K types, with only the L type Continental Coupe, better known as Kimbers' Folly, suffering from a disastrous lack of interest. The 6 cylinder cars were very smooth in their delivery of power although in no way gave the same exhilaration to the driver as the smaller J2 Midgets which continued to sell steadily although suffering from serviceability problems with premature failure of the crankshaft. Racing development was costly and although Abingdon's expenditure was quite modest in relation to the number of competition victories, the concentration of effort on this side had been at the expense of fulfilling the market needs. A directive from Sir William Morris to restrict expenditure on racing was met with dismay and there were also restrictions imposed on Kimber to buy as many of the components needed for MG from within the Morris group. In the latter half of 1933, this led to the severing of the long standing relationship for the supply of bodies from Carbodies with them now being made by Morris Bodies Branch. Further directives demanded slimming down of the range of cars offered and therefore in February 1934 the MG range was changed by the introduction of a new P type Midget to replace the J2 Midget. This was closely followed in March with the introduction of the N type Magnettes which were to replace the Magnas and at the same time inject some standardisation and rationalisation into the MG range. It is worthy of note that at the 1934 Motor Show the K series was still promoted alongside the new N types and the main reason for this being the glut of saloon and open 4 seater bodies held in stock. The best features of previous models were incorporated into the N types and it was evident that a lot of time had been spent in designing improvements into this new range which consisted of either 2 or 4 seat open tourers or Allingham coachbuilt 2/4 seater bodies or the option of the delightful Airline Coupe. There was also a pillarless saloon which was designated the KN which was simply the old K saloon with the new N type engine and a hybrid ND two seater which made use of redundant K2 slab-tank bodies mated to the new N type chassis. Only 24 of these were built. Finally there was a special racing version, of which only 6 were made, designated the NE racer. This car was developed specially to compete in the 1934 TT races in which superchargers were banned for the first time. This move was seen as an attempt to break MG's previous dominance of the race, however the NE won the race on handicap against stiff competition from some of the larger 4.5 litre cars. The engine of the N type was a modified version of the KD power unit of 1271 cc and with a respectable power output of 56.6 bhp @ 5,500 rpm. Both the cylinder head and block were changed together with modifications to the inlet manifolding, oil lubrication system and clutch. These modifications gave the new unit a 25% increase in power over the original KD engine and gave the N type quite brisk performance. The gearbox changed from pre-selector to manual non-synchromesh and was very similar to that used in the L type Magnas. The gear selector utilised a reverse gate as in the Magna but the ratios were changed to give lower starting ratios in first and second and higher cruising ratios in third and fourth. The chassis frame was quite different from the earlier cars and departed for the first time from the standard "ladder" type frame. It tapered, being wider at the rear than the front and also for the first time the bodies were mounted on Silentbloc rubber bushes. These were fixed to the side and the rear of the main chassis and altogether produced a far more comfortable ride. However the days of the high revving overhead camshaft engines were numbered and although production of the "Light Sixes" continued on into 1936, the N type was certainly the last of these. Larger capacity four cylinder pushrod overhead valve engines mounted on rubber blocks were soon to give better and more refined performance with enhanced torque characteristics and appeared for the first time in 1936 in the VA 1.5 litre saloon.